OMG, this recipe is absolutly amazing. I have shared this with frinds and have gotten rave reviews. All the flavors and balanced well through out. 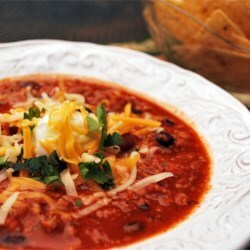 Top with shredded sharp cheese, chopped onion and a dollop of sour cream and you have a winning recipe!!! !